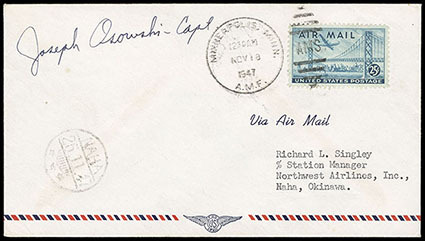 Ryukyus, (Pioneer Flight) 1947 Northwest Airlines Inaugural Flight, Minneapolis, Minn. to Naha, airmail cover franked with U.S., 25¢ Airmail (C36) tied by "Minneapolis, Minn., A.M.F., Nov 18, 1947" duplex, with Naha, 25.11.47 return dispatch cds, signed by pilot, Very Fine, ex-Bush. AAMC No. 1 Estimate $300 - 400. 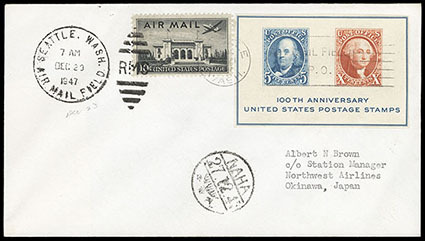 Ryukyus, (Pioneer Flight) 1947 Northwest Airlines Inaugural Flight, Seattle, Wash. to Naha, cover franked with U.S., 1947, 10¢ Airmail + 5¢-10¢ Centennial (C34, 948) tied by "Seattle, Wash., Dec 23, 1947" machine & airfield postmarks, with "Naha, 27.12.47" cds, Very Fine, only 42 covers flown. AAMC No. 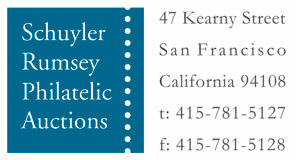 4 Estimate $250 - 350. 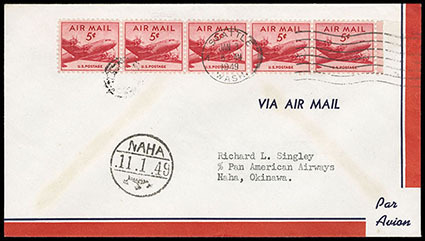 Ryukyus, (Pioneer Flight) 1949 Pan American Airways Extension, Seattle, Wash. To Naha, airmail cover franked with U.S. 1947, 5¢ Airmail, horizontal strip of five (C33) tied by "Seattle, Wash., Jan 3. 1949" machine postmark and target handstamp, additional "Naha, 11.1.40" receiving postmark, Very Fine, very rare with only 17 covers carried, ex-Bush. AAMC No. 12 Estimate $300 - 400. 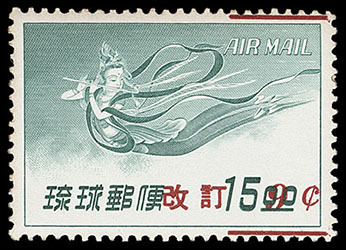 Ryukyus, Airmail, 1951-54, 2nd Issue, 13y-50y issues, imperf proofs, all position 36, left margin singles, without gum as issued, wide margins, 30y showing part of trim line in selvage, Extremely Fine, a splendid matched set, from sheets of which many were damaged, ex-Kamiyama; each with 1992 R.P.S.S. certificate. 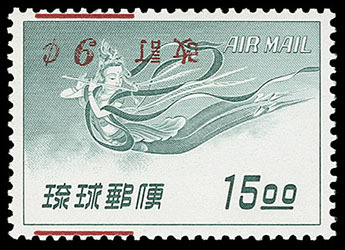 Ryukyus, Airmail, 1959, 3rd Issue surcharged, 9¢ on 15y blue green, split surcharge, o.g., never hinged (light gum tone), showing bars transposed in top and bottom margin, Very Fine, a very rare variety, with only 18 examples exist. Scott No. C14 var. Estimate $150 - 200. 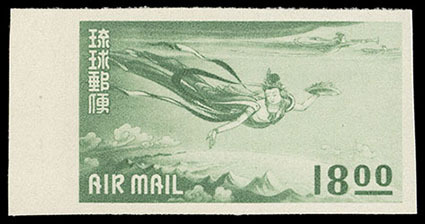 Ryukyus, Airmail, 1959, 3rd Issue surcharged, 9¢ on 15y blue green, surcharge inverted, slightly transposed with bar split, o.g., never hinged, Extremely Fine, scarce with only 300-400 produced; with 1994 R.P.S.S. certificate. SG No. 81a. J.S.C.A. No. A14va. JSDA No. 14 var. 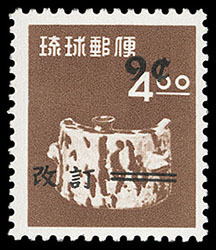 Ryukyus, Airmail, 1960, Regular Issue surcharged, 9¢ on 4y brown, rose red Mihon chop handstamp, showing in upper right corner, o.g., never hinged, Very Fine, very rare with only 10 examples known, ex-Kamiyama. Scott No. C19S Estimate $300 - 400. 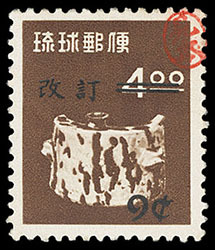 Ryukyus, Airmail, 1960, Regular Issue surcharged, 9¢ on 4y brown, surcharge transposed, o.g., never hinged, bright and fresh, Very Fine, only 80 examples with this error were found in a single sheet of 100; with 1992 R.P.S.S. certificate. J.S.C.A. No. A19vc. JSDA No. 19 var. 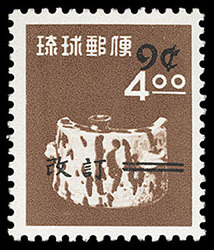 Ryukyus, Airmail, 1960, Regular Issue surcharged, 9¢ on 4y brown, surcharge transposed, bright and fresh, Very Fine, rare with only 80 examples produced.